On Tuesday, February 3rd, the UK Parliament will debate whether to approve the use of mitochondrial replacement therapy or MRT in the UK. 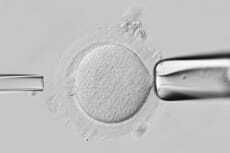 This therapy, similar to IVF, prevents the transmission of mitochondrial diseases from mother to child. Mitochondrial diseases are life-threatening with symptoms often arising in childhood including stunted development, neurological disorders, heart disorders, and stomach and digestive problems among others and can even result in childhood death. Currently, there are no cures, only ways to manage the symptoms. MRT is a technique that was developed in the US and UK, including scientists at the NYSCF Research Institute, and was the subject of a profile in the New York Times Magazine on June 29th, 2014. The debate and hopeful approval for use in the UK on Tuesday may affect or inform the debate surrounding approval and use of the technique in the US. Over 12,000 women in the US alone could benefit from this new technique that would allow them to have genetically related healthy children and NYSCF has urged Parliament to approve it’s use in the UK.